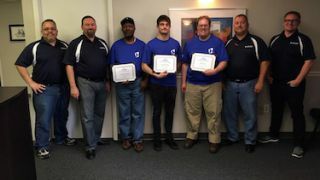 Herman Integration Services inaugural AV Bootcamp Training Class graduated last week. As part of a new corporate initiative, Herman Integration Services launched a week-long boot camp to bring new recruits to the AV industry and Herman. The Herman Bootcamp curriculum focused on five main topics including: identifying common cable, terminating cable, mounting displays, installing low voltage rings, and installing speakers. In addition, the new recruits learned the business workflow from making an initial sale to the final billing.